Our entire website is secured with a 256-bit encrypted SSL certificate, and is 100% PCI compliant. Your personal information (Name, Email Address, etc. ), order history, and general activity shared and/or stored on ojaioliveoil.com will never be sold nor shared with third parties. 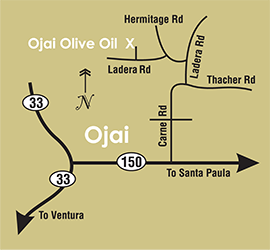 All newsletters and promotional emails sent by Ojai Olive Oil, Inc. are directly sent through software that runs on the server(s) that host ojaioliveoil.com, and may be opted out of at any time. Copyright © Ojai Olive Oil, Inc.